Under construction in 2015. Final form is a metallic dish. The Five-hundred-meter Aperture Spherical radio Telescope (FAST; Chinese: 五百米口径球面射电望远镜), nicknamed Tianyan (天眼, lit. "Sky Eye" or "The Eye of Heaven") is a radio telescope located in the Dawodang depression (大窝凼洼地), a natural basin in Pingtang County, Guizhou Province, southwest China. It consists of a fixed 500 m (1,600 ft) diameter dish constructed in a natural depression in the landscape. It is the world's largest filled-aperture radio telescope, and the second-largest single-dish aperture after the sparsely-filled RATAN-600 in Russia. It has a novel design, using an active surface made of metal panels that can be tilted by a computer to help change the focus to different areas of the sky. The cabin containing the feed antenna suspended on cables above the dish is also moved using a digitally-controlled winch by the computer control system to steer the instrument to receive from different directions. The telescope made its first discovery of two new pulsars in August 2017. The new pulsars PSR J1859-01 and PSR J1931-02, which are also referred to as FAST pulsar #1 and #2 (FP1 and FP2), were detected on 22 and 25 August and are 16,000 and 4,100 light years away, respectively. They were independently confirmed by the Parkes Observatory in Australia on 10 September. The telescope had discovered 44 new pulsars by September, 2018. The telescope was first proposed in 1994. The project was approved by the National Development and Reform Commission (NDRC) in July 2007. A 65-person village was relocated from the valley to make room for the telescope and an additional 9,110 people living within a 5 km radius of the telescope were relocated to create a radio-quiet area. About 500 families tried to sue the local government. Villagers accused the government of forced demolitions, unlawful detentions and not giving compensation. 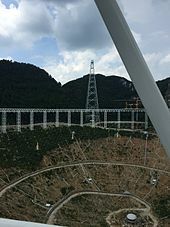 The Chinese government spent around $269 million in poverty relief funds and bank loans for the relocation of the local residents, while the construction of the telescope itself cost US$180 million. On 26 December 2008, a foundation laying ceremony was held on the construction site. Construction started in March 2011, and the last panel was installed on the morning of 3 July 2016. Originally budgeted for CN¥700 million,:49 the final cost was CN¥1.2 billion (US$180 million). Significant difficulties encountered were the site's remote location and poor road access, and the need to add shielding to suppress radio-frequency interference (RFI) from the primary mirror actuators. There are still ongoing problems with the failure rate of the primary mirror actuators. Testing and commissioning began with first light on 25 September 2016. The first observations are being done without the active primary reflector, configuring it in a fixed shape and using the Earth's rotation to scan the sky. Subsequent early science will take place at lower frequencies while the active surface is brought to its design accuracy; longer wavelengths are less sensitive to errors in reflector shape. It will take three years to calibrate the various instruments so it can become fully operational. Local government efforts to develop a tourist industry around the telescope are causing some concern among astronomers worried about nearby mobile telephones acting as sources of RFI. A projected 10 million tourists in 2017 will force officials to decide on the scientific mission versus the economic benefits of tourism. 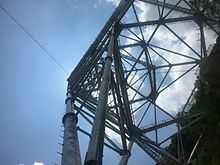 FAST has a fixed primary reflector located in a natural sinkhole in the landscape (karst), focusing radio waves on a receiving antenna in a "feed cabin" suspended 140 m (460 ft) above it. The reflector is made of perforated aluminium panels supported by a mesh of steel cables hanging from the rim. FAST's surface is made of 4450 triangular panels, 11 m (36 ft) on a side, in the form of a geodesic dome. 2225 winches located underneath make it an active surface, pulling on joints between panels, deforming the flexible steel cable support into a parabolic antenna aligned with the desired sky direction. Although the reflector diameter is 500 metres (1,600 ft), only a circle of 300 m diameter is used (held in the correct parabolic shape and "illuminated" by the receiver) at any one time. :13 Thus, the name is a misnomer: the aperture is not 500 m, nor is it spherical. Its working frequency range of 70 MHz to 3.0 GHz, with the upper limit set by the precision with which the primary can approximate a parabola. It could be improved slightly, but the size of the triangular segments limits the shortest wavelength which can be received. This range is covered by nine receivers under the feed cabin,:30 with the 1.23–1.53 GHz band around the hydrogen line using a 19-beam receiver built by the CSIRO as part of the ACAMAR collaboration between the Australian Academy of Science and the Chinese Academy of Sciences. The Next Generation Archive System (NGAS), developed by the International Center for Radio Astronomy (ICRAR) in Perth, Australia and the European Southern Observatory will store and maintain the large amount of data that it collects. The FAST telescope joined the Breakthrough Listen SETI project in October 2016 to search for intelligent extraterrestrial communications in the Universe. The primary driving force behind the project was Nan Rendong (南仁东), a researcher with the Chinese National Astronomical Observatory, part of the Chinese Academy of Sciences. He held the positions of chief scientist and chief engineer of the project. He passed away on 15 September 2017 in Boston due to lung cancer. The Academy has been having difficulty finding staff for the telescope. Its size requires a large staff, but they are having difficulty attracting astronomers to its remote location, making it unlikely that the telescope will operate at full capacity for some time. As China has few radio astronomers, they are soliciting staff internationally, but the pay offered is low, and many are worried about heavy-handed management for this high-profile project. The Academy has likewise been searching for a qualified director of scientific operations for FAST since May 2017, but has not been able to fill the position. Although an offer of US$1.2 million is widely quoted, this is primarily a one-time research grant, not salary or ongoing support. The basic design of FAST is similar to the Arecibo Observatory radio telescope. Both are fixed primary reflectors installed in natural hollows, made of perforated aluminum panels with a movable receiver suspended above. And both have an effective aperture smaller than the physical size of the primary. There are, however, five significant differences in addition to the size. First, Arecibo's dish is fixed in a spherical shape. Although it is also suspended from steel cables with supports underneath for fine-tuning the shape, they are manually operated and adjusted only for maintenance. It has a fixed spherical shape and two additional reflectors suspended above to correct for the resultant spherical aberration. Second, Arecibo's receiver platform is fixed in place. To support the greater weight of the additional reflectors, the primary support cables are static, with the only motorised portion being three hold-down winches which compensate for thermal expansion. :3 The antennas are mounted on a rotating arm below the platform. :4 This smaller range of motion limits it to viewing objects within 19.7° of the zenith. Third, Arecibo can receive higher frequencies. The finite size of the triangular panels making up FAST's primary reflector limits the accuracy with which it can approximate a parabola, and thus the shortest wavelength it can focus. Arecibo's more rigid design allows it to maintain sharp focus down to 3 cm wavelength (10 GHz); FAST is limited to 10 cm (3 GHz). Improvements in position control of the secondary might be able to push that to 6 cm (5 GHz), but then the primary reflector becomes a hard limit. Fifth, Arecibo's larger secondary platform also houses several transmitters, making it one of only two instruments in the world capable of radar astronomy. The NASA-funded Planetary Radar System allows Arecibo to study solid objects from Mercury to Saturn, and to perform very accurate orbit determination on near-earth objects, particularly potentially hazardous objects. Arecibo also includes several NSF funded radars for ionospheric studies. These powerful transmitters are too large and heavy for FAST's small receiver cabin, so it will not be able to participate in planetary defense. ^ "中国"天眼"能不能发现外星人？" [Can Chinese Tianyan find aliens?] (in Chinese). Xinhua News Agency. 22 February 2016. ^ Brinks, Elias (11 July 2016). "China Opens the Aperture to the Cosmos". The Conversation. US News and World Report. Retrieved 12 August 2016. ^ a b c d e f Nan, Rendong (April 2008). Project FAST — Five hundred meter Aperture Spherical radio Telescope (PDF). China-US Bilateral Workshop on Astronomy. Beijing. Retrieved 4 July 2016. 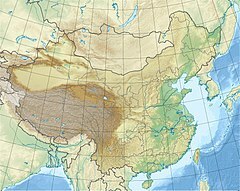 ^ "China starts building world's biggest radio telescope". New Scientist. 8 June 2011. Retrieved 19 October 2015. ^ a b c d e f g h Normile, Dennis (26 September 2016). "World's largest radio telescope will search for dark matter, listen for aliens". Science News. doi:10.1126/science.aah7346. ^ Xinhua (25 September 2016). "Xi commends launch of world's largest radio telescope in China" – via China Daily. ^ "FAST Homepage in English". Retrieved 15 January 2017. ^ Harris, Margaret (27 January 2009). "China builds super-sized radio telescope". physicsworld.com. Retrieved 20 October 2015. ^ Jones, Andrew (10 October 2017). "China's huge new FAST radio telescope discovers two new pulsars". GBTimes. ^ McGlaun, Shane. "Chinese FAST telescope finds multiple pulsars in early use". slashgear. Retrieved 11 October 2017. ^ Jones, Andrew. "China's FAST radio telescope detects three more pulsars". gbtimes. Retrieved 14 December 2017. ^ "China's FAST telescope identifies 44 pulsars". scio.gov.cn. Retrieved 12 September 2018. ^ a b Jin, C. J.; Nan, R. D.; Gan, H. Q. (2007). "The FAST telescope and its possible contribution to high precision astrometry" (PDF). Proceedings of the International Astronomical Union. 248: 178–181. Bibcode:2008IAUS..248..178J. doi:10.1017/S1743921308018978. Retrieved 19 October 2015. ^ a b c d e "Xinhua Insight: Installation complete on world's largest radio telescope". Xinhua. 3 July 2016. ^ Wong, Edward (17 February 2016). "China Telescope to Displace 9,000 Villagers in Hunt for Extraterrestrials". New York Times. The report said officials were moving 2,029 families, a total of 9,110 people, who live within about three miles of the telescope in the area of Pingtang and Luodian Counties in the southwestern province of Guizhou. Depopulating the area will create "a sound electromagnetic wave environment" for the telescope, Xinhua said. ^ "'Thank the aliens': Thousands displaced for China's huge telescope". AFP. 1 December 2016. Retrieved 1 December 2016. ^ De Jesus, Cecille (26 September 2016). Caughill, Patrick (ed.). "The Quest For Life Beyond Earth: The World's Largest Radio Telescope Just Went Online". Futurism. ^ "中国科学院·贵州省共建国家重大科技基础设施500米口径球面射电望远镜（ＦＡＳＴ）项目奠基" (in Chinese). Guizhou Daily. 27 December 2008. Archived from the original on 12 January 2009. Retrieved 28 December 2008. ^ a b Quick, Darren (16 June 2011). "China building world's biggest radio telescope". gizmag. Retrieved 13 August 2012. ^ a b c d e f g Rendong Nan; Di Li; Chengjin Jin; Qiming Wang; Lichun Zhu; Wenbai Zhu; Haiyan Zhang; Youling Yue; Lei Qian (20 May 2011). "The Five-Hundred-Meter Aperture Spherical Radio Telescope (FAST) Project". International Journal of Modern Physics D. 20 (6): 989–1024. arXiv:1105.3794. Bibcode:2011IJMPD..20..989N. doi:10.1142/S0218271811019335. ^ "China completes installation of world's largest telescope". The BRICS Post. 3 July 2016. ^ a b McKirdy, Euan (12 October 2015). "China looks to the stars with creation of world's largest radio telescope". CNN News. Retrieved 19 October 2015. ^ a b c d Shen, Alice (31 October 2018). "Wanted: Researchers for China's mega telescope to interpret signals from across the universe". South China Morning Post. ^ a b Morelle, Rebecca (25 September 2016). "China's colossal radio telescope begins testing". BBC News. Retrieved 25 September 2016. ^ Yue, Youling; Li, Di; Nan, Rendong (20–31 August 2012). FAST low frequency pulsar survey. Neutron Stars and Pulsars: Challenges and Opportunities after 80 years. arXiv:1211.0748. doi:10.1017/S174392131300001X. ^ Chen, Zhou; Gang, Wu. "Scientists Concerned About Plans to Make Telescope a Tourist Attraction". Caixin Online. Retrieved 26 September 2016. ^ Chen, Stephen (24 August 2017). "How noisy Chinese tourists may be drowning out alien signals at the world's biggest telescope". South China Morning Post. Retrieved 24 August 2017. ^ "China assembles world's largest telescope in Guizhou". Xinhua. 24 July 2015 – via China.org.cn. ^ a b c d e f Williams, R.L. II (July 2015). Five-Hundred Meter Aperture Spherical Radio Telescope (FAST) Cable-Suspended Robot Model and Comparison with the Arecibo Observatory (PDF) (Report). Ohio University. Although this source contains wealth of detail, its reliability is questionable. It describes in some detail (at the end of p. 4) the fact that FAST's dish is actually 519.6 m in diameter; papers published by the project scientists, who would presumably know, are explicit that the dish extends "up to a girder ring of exactly 500 m diameter". ^ Jin Chengjin; et al. (23 October 2013). "The optics of the Five-hundred-meter Aperture Spherical radio Telescope" (PDF). International Symposium on Antennas and Propagation. ^ "Receiver Systems". FAST Home Page. National Astronomical Observatories, Chinese Academy of Sciences. Retrieved 28 June 2014. ^ "Australia-ChinA ConsortiuM for Astrophysical Research (ACAMAR)". CAASTRO: ARC Centre of Excellence for All-sky Astrophysics. Archived from the original on 7 May 2016. Retrieved 1 October 2016. ^ Strom, Marcus (6 May 2016). "CSIRO technology to be at the heart of the world's largest radio telescope in China". Sydney Morning Herald. Fairfax Media. Retrieved 7 May 2016. ^ "FAST Radio Telescope Open for Business - Sky & Telescope". Sky & Telescope. 27 September 2016. Retrieved 10 October 2016. ^ Hobbs, G.; Dai, S.; Manchester, R.N. ; Shannon, R.M. ; Kerr, M.; Lee, K.J. ; Xu, R. (1 July 2014). "The Role of FAST in Pulsar Timing Arrays". arXiv:1407.0435 [astro-ph.IM]. ^ "National Astronomical Observatories of China, Breakthrough Initiatives Launch Global Collaboration in Search for Intelligent life in the Universe" (Press release). Breakthrough Initiatives. 12 October 2016. Retrieved 14 October 2016 – via Astrobiology Web. ^ "中国天眼"首席科学家南仁东病逝 享年72岁". China News Service (in Chinese). 16 September 2017. ^ a b c d Berger, Eric (5 November 2018). "China still having trouble staffing up its mega-telescope". Ars Technica. ^ "院士：建世界最大射电望远镜不是为了发展旅游". Caixin Online (in Chinese). 25 September 2016. There is an English-language version of the article, but that does not mention this issue，which is only described in the much longer and more detailed Chinese version. ^ Chen, Stephen (3 August 2017). "China is offering over a million dollars for a foreigner to run the world's largest telescope, so why is nobody applying?". South China Morning Post. ^ Jin, Chengjin; Zhu, Kai; Fan, Jin; Liu, Hongfei; Zhu, Yan; Gan, Hengqian; Yu, Jinglong; Gao, Zhisheng; Cao, Yang; Wu, Yang (23 October 2013). 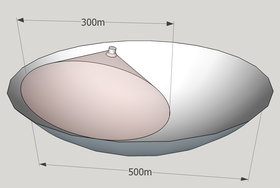 The optics of the Five-hundred-meter Aperture Spherical radio Telescope (PDF). International Symposium on Antennas and Propagation. Nanjing: National Astronomical Observatories, Chinese Academy of Sciences. ^ Qiu, Yuhai H. (11 December 1998). "A novel design for a giant Arecibo-type spherical radio telescope with an active main reflector" (PDF). Monthly Notices of the Royal Astronomical Society. Beijing Astronomical Observatory, The Chinese Academy of Sciences. 301 (3): 827–830. doi:10.1111/j.1365-8711.1998.02067.x. ^ Cortés-Medellín, Germán (13 September 2010). AOPAF: Arecibo Observatory Phased Array Feed (PDF) (Report). National Astronomy and Ionosphere Center, Cornell University. ^ a b "Arecibo: General Statistical Information on Antenna". National Astronomy and Ionospheric Center. 3 January 2005. Retrieved 5 July 2016. Nan, R.; et al. (16 June 2002). "Kilometer-square Area Radio Synthesis Telescope – KARST" (PDF). Archived from the original (PDF) on 29 October 2006. Jin, C. J.; Nan, R. D.; Gan, H. Q. (October 2007). "The FAST telescope and its possible contribution to high precision astrometry" (PDF). Proceedings of the International Astronomical Union. 3 (S248): 178–181. Bibcode:2008IAUS..248..178J. doi:10.1017/S1743921308018978. Li, Di; Pan, Zhichen (30 December 2016). "The Five-hundred-meter Aperture Spherical Radio Telescope (FAST) Project". Radio Science. 51 (7): 1060–1064. arXiv:1612.09372. Bibcode:2016RaSc...51.1060L. doi:10.1002/2015RS005877. This page was last edited on 2 February 2019, at 12:20 (UTC).